Vegetable caterpillar fungi usually infect insects and their larvae. 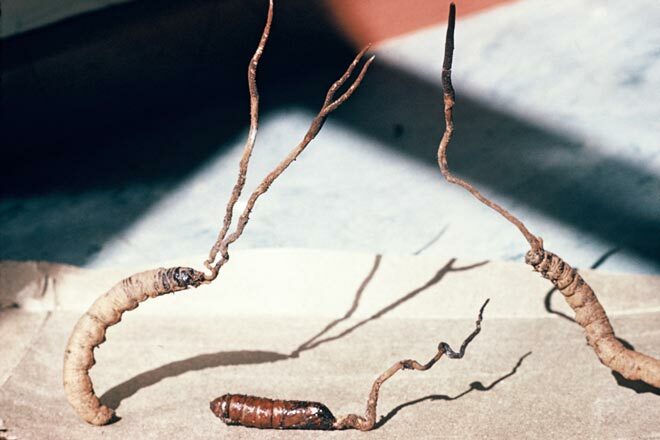 In this case, underground-dwelling caterpillars of a native moth have been infected by the fungus Cordyceps robertsii. The fungus absorbs nutrients from the tissue of the caterpillar and in the process mummifies it. Its fruiting bodies are formed on top of a long stalk that projects above the ground. Vegetable caterpillars are edible. In the past, Māori also burnt them and used the charcoal produced for tattooing. wow. creepy little things aren't they?